This heart rending photo was taken by Joe O’Donnell, who was sent by the U.S. military to document the horrors inflicted upon the Japanese by air raids and atomic bombs in 1945. In this photo, the little boy had bought his brother to a cremation spot. He was barefooted and in perhaps trying to play the role of oldest functioning family member left remaining, he was clearly copying the stand-to-attention stance he would have seen amongst the warring uniformed adults. “I saw a boy about ten years old walking by. He was carrying a baby on his back. 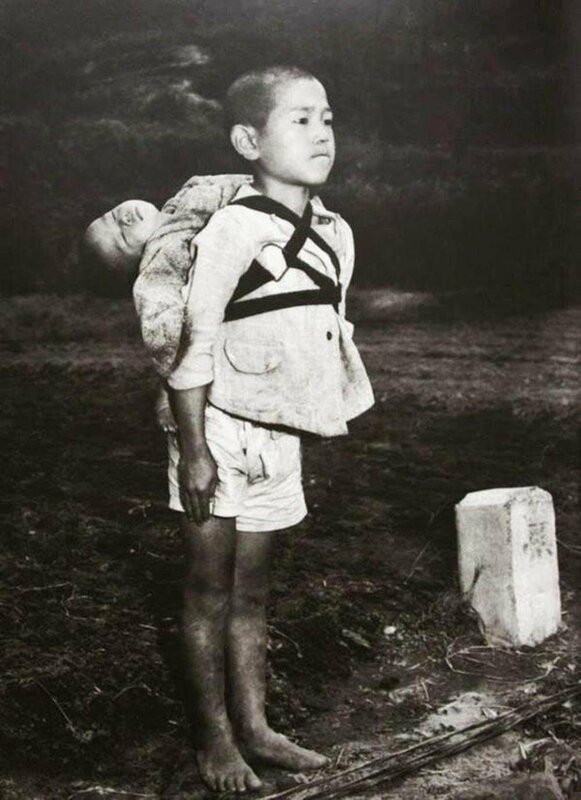 In those days in Japan, we often saw children playing with their little brothers or sisters on their backs, but this boy was clearly different. I could see that he had come to this place for a serious reason. He was wearing no shoes. His face was hard. The little head was tipped back as if the baby were fast asleep. “The boy stood there for five or ten minutes. The men in white masks walked over to him and quietly began to take off the rope that was holding the baby. That is when I saw that the baby was already dead. The men held the body by the hands and feet and placed it on the fire.